Can I program the "FN" key on my Razer BlackWidow or Razer BlackWidow Ultimate? Can I turn off the Razer Triple Headed Snake Logo that is at the bottom of the Razer BlackWidow Ultimate? Yes the logo lighting can be turned on and off in conjunction with the back panel lighting. Can I use On the Fly Macro Recording without installing the drivers? Do I have to keep the application running by keeping the system tray icon open? On the Fly Macro Recording only works when the driver is installed and running in the background. The system tray icon should show up in the Windows Taskbar. If you start the recording without the drivers or the system tray application, the LED for the On the Fly Macro Recording on the Razer BlackWidow will blink three times and go off instead of remaining lit. Please install the driver and allow the system tray application to run in order to make use of this recorder. Can I use the Razer BlackWidow Mac drivers with the PC layout of the Razer BlackWidow or Razer BlackWidow Ultimate? Is the Razer BlackWidow Ultimate available in backlit colours other than green? 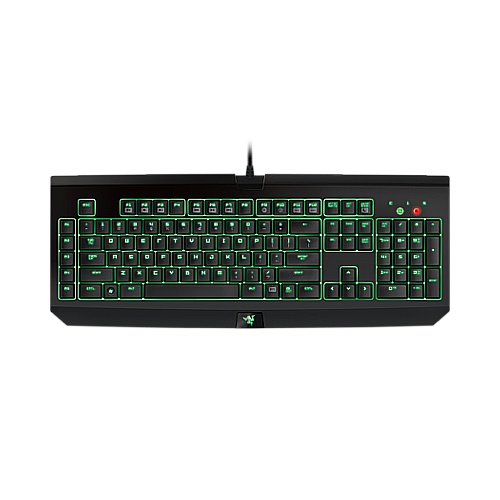 The Razer BlackWidow Ultimate is only available in green backlit LEDs. When I try to perform "on the fly recording" on my Razer BlackWidow Ultimate, the LED lights three times and then goes off. I am unable to perform "on the fly recording". How can I fix this? The Razer BlackWidow does not have any options to disable the delays in the on-the-fly macro recording. To ignore delays between recorded events please open the BlackWidow configurator and record the Macro there. In the configurator you will see a box that can be checked in order to ignore delays. Why do some of the keys have reversed graphics when compared to other keyboards? For example all the number keys and keys like > and <. This is normal and intentional. The graphics are reversed on these keys due to the placement of the individual LED backlighting under each key on the Razer BlackWidow Ultimate. We chose to illuminate the part of the key that was active during normal key presses and not when the shift key was used. The Razer BlackWidow, without backlight illumination, also has the same inverted design to be consistent with the Razer BlackWidow Ultimate’s keyboard layout. If you were unable to find the answer to your question(s) in our FAQ, please don’t hesitate to contact us here or call1-888-697-2037.